Each year, the Piedmont Design Awards spotlight outstanding projects in categories ranging from Storybook Architecture to Detached Second Units. At this year’s ceremony, architects Arleta Chang and Cindy Chan took home the award for Excellent Indoor/Outdoor Living Space. Congratulations, Arleta and Cindy! The project, a remodel and addition to the home of clients Hanna Lin and Michael Lucaccini, involved transforming the back of the house to accommodate a series of tiered decks. 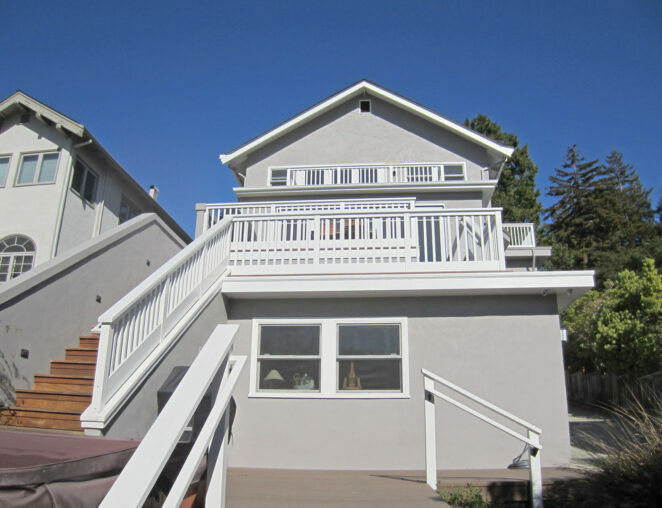 Together with Mitch Filbert of Construction Effects, they converted an existing carport into a 2-car garage with a roof deck, and added a stairway to the rear yard. The addition of a family room to the main level of the home increased the square footage of the upper deck. In keeping with the Craftsman and Prairie styles of its exterior, the railings, finishes, and other details of the addition were selected to harmonize with the existing structure. During the design process, particular care was vested in featuring views and light prominently. 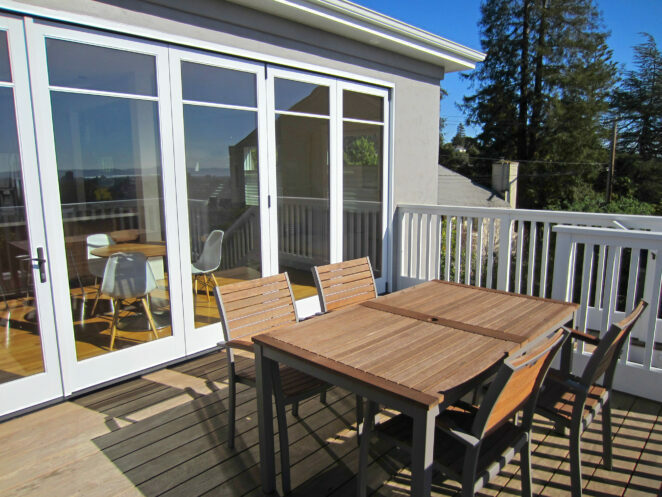 Large accordion doors open out from the kitchen and onto the main deck, adding drama to the interplay between interior and exterior. The doors span the entire western wall of the kitchen, and when fully opened act as a giant gateway, emphasizing the panoramic bay views afforded by the property’s location. The interiors of the home are understated and modern; warm woods, clean whites, and continuous lines provide the ideal backdrop for the drama of shifting light, as it moves from the east in the morning, filtering through a large skylight in the remodeled bath, then travels West, illuminating the remodeled kitchen and family room in the evening. All aspects of this project, interior and exterior, seem in service of this play of light.